Indiana State University's Community School of the Arts' summer program has classes for all ages taught by qualified instructors in all areas of the arts -- all summer long. School of the Arts instructor Suzanne Finn, who has been with the organization for about four years, is a ceramics instructor for summer camp and teaches "Squiggles and Doodles and Messy Hands." "I come up with creative lesson plans and ways in which to make my classes unique," said Finn, who earned her a degree in art education in 2013. "The class exposes children to various mediums, from paint to clay to soft sculpture. The reason I think children this age should take this camp is that preschool age and younger is the perfect age to experiment with visual arts," Finn said. "This leads the children to explore the world around them too." Aside from "Squiggles and Doodles and Messy Hands," the School of the Arts also offers another class for children ages 4 and younger called "Tiny Tunes." "It's also fun to squish clay! Children have lots of success with ceramics, and this will encourage more exploration into the arts," Finn said. The classes Finn teaches for ceramics are "It's All Clay-tastic!" for youngsters, ages 8-12, and "‘Mud'-ling With Clay" for children ages 5 to 8. 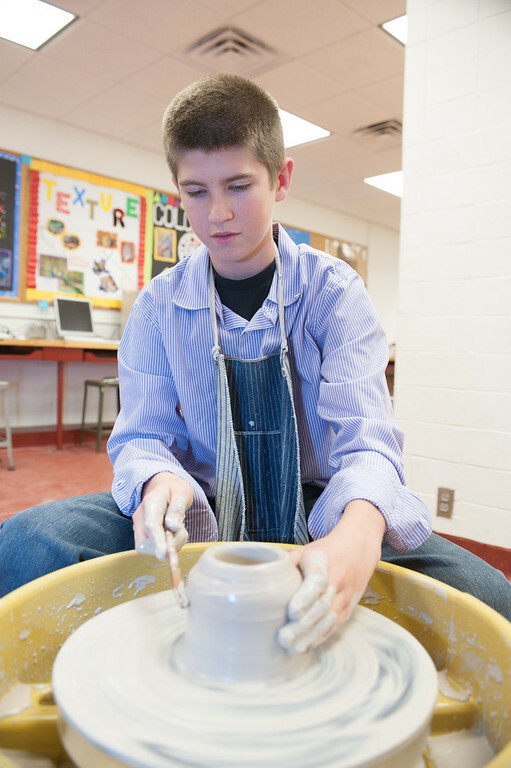 The ceramics classes offer the opportunity to hand-build as well as to throw clay on the wheel. Children also glaze their pottery and learn what the kiln-firing process is all about. "The Community School of the Arts offers a wide variety of classes exploring all of the arts," Finn said. Visual arts are not the only art programs that are available through the Community School of the Arts during the summer. Also offered are are music classes and theater classes. One of the most popular classes is "Arts Sampler," for ages 5-7 or 8-11, offered as an all-day program throughout a week, 7:45 a.m.-5:15 p.m.
"There are six all-day ‘Arts Samplers' offered this summer. They're phenomenal, and kids love them," said Petra Nyendick, director of Community School of the Arts. The Community School of the Arts offers a wide variety of music classes, such as "Tiny Tunes Pre-K" for ages 4 and younger, "My First Piano Camp!" for ages 5-7, CSA "Youth Orchestra" for grades 5-12, "Music For Time Travelers: The History of Pop" for ages 12 and up, "Garage Band: Sound Mixing" for ages 12 and up, "Sing and Dance!" for ages 7-11, and many more. "During the ‘Hand Drumming and Percussion Techniques' classes, kids will learn about different styles of drumming and will be able to try out a variety of percussion instruments. I'm really excited about that class, because it's a new class being offered this summer," Nynedick said. "Budding A.M. 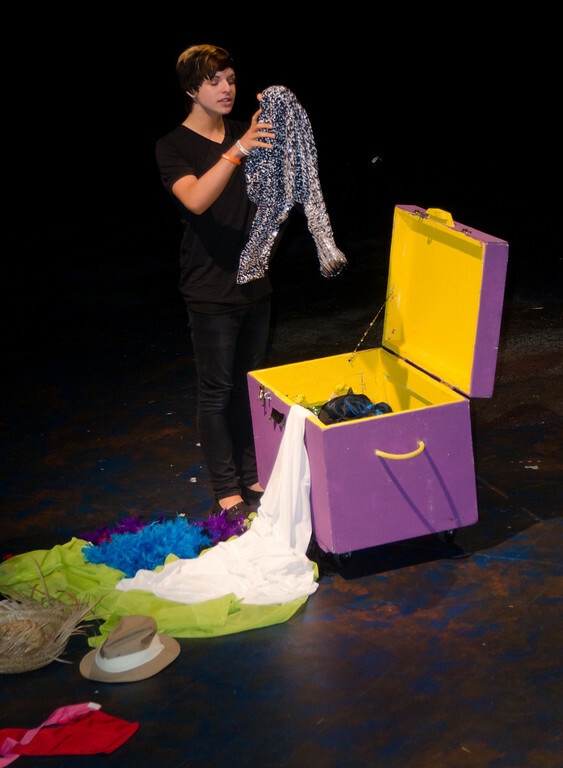 Actors" and "Budding P.M. actors" are available for children to take to experience the performing arts. "I'm looking at some of the adult offerings for myself this summer!" Finn said. Majority of the workshops are single evening classes. Some of the classes available for adults include "Oil Pastel Still Lifes," "Study A Master In Acrylic" and "Collage." "The reason to take one or all of these courses is because it's good to expose yourself to things outside of your comfort zone and try something new," said Finn. "With the limited time given to the arts in schools, it's important to keep supporting children's creative endeavors." Photos: http://isuphoto.smugmug.com/Events/Events-by-Year/2013/Fusion-Children-Play/i-7MTLFKv/1/XL/DSC_7194-XL.jpg -- A student performs during a theater class at the Community School of the Arts at Indiana State University. http://isuphoto.smugmug.com/Other/Publications/Publications-department-brochu/Publication-Music-and-Arts/CSA-Brochure-2012/i-jzT8J7q/0/XL/03_14_12_CSA_brochure-5783-XL.jpg -- A student works on a clay piece during a pottery class at the Community School of the Arts at Indiana State University. http://isuphoto.smugmug.com/Events/Events-by-Year/2012/Music-Makers-at-the/i-QVtGddx/0/XL/DSC_6050-32-XL.jpg -- A student participates in a beginner piano class at the Community School of the Arts at Indiana State University. Writer: Libby Legett, media relations assistant, Office of Communications and Marketing, Indiana State University, 812-237-3773.